It’s always a good idea to bet on employees’ creativity. That’s why, looking for new ways to integrate our team and enhance knowledge sharing, we decided to give an internal hackathon a try. It’s not our first attempt at employee development. Mentoring teams work together on a given tech and then discuss what they learned during monthly meetings called DevTalks. We sponsor trainings and attending conferences. Our senior developers meet every two weeks for innovation time off sessions. We’ve also participated in several hackathons, including the Koding hack.summit 2016, which we won against 98,000 other participants. These are all good, tried and tested ideas for improving employees’ skills and knowledge sharing. But as we see it, there’s always room for innovation. 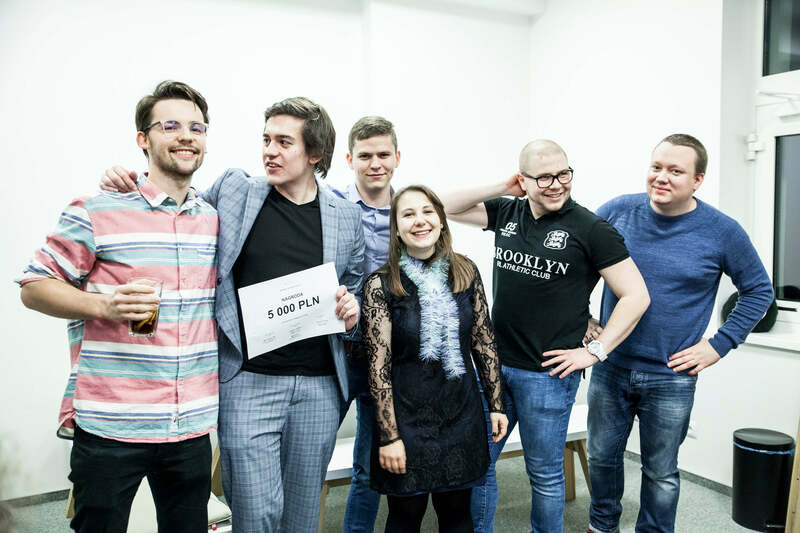 “Organizing a hackathon we had two goals – to spot employees with leadership skills and to show how to build a product from scratch” – says Zbigniew Czarnecki, CEO at Apptension. And, on top of that, as we were near to the Holidays break, we wanted it to fit the occasion and to be presented during our annual Holiday party. 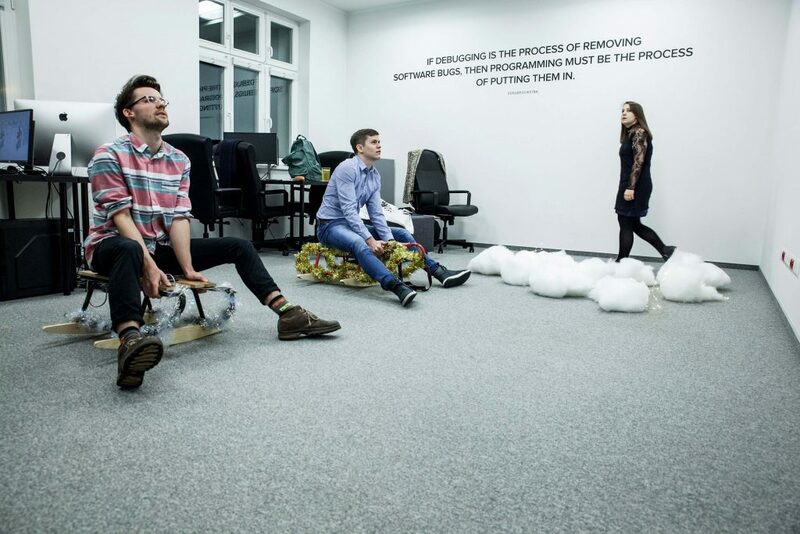 An internal hackathon, which we called Intense, seemed like a perfect match, letting our employees learn new skills, get creative, work together and have fun along the way. We’ve also added a cash prize of 5k PLN to the mix. We used our mentoring groups to create core teams for this hackathon, choosing tech leaders from frontend developers, so that they could learn how to run a project and develop their leadership skills. At the same time, our senior frontend developers, who usually act as mentors for other programmers, were asked to become Product Owners, so they also had a possibility to learn how to oversee a project from the clients’ perspective. From then on, we left everything up to tech leaders. They only shared what they’d accomplished during three demo meetings with the jury, consisting of Apptension’s management. Then, they could also get some advice on the further development of the project. Finally, before the hackathon’s final, we opened up our office for the weekend, providing teams with food and drinks, so they could add some final touches to their project before handing them over to the jury. After two intense months, the projects were done. We planned their presentation as the opening of our annual Holiday party, hosted at our office. A first project was a video game called Sled Run. Designed to be played by two players simultaneously, this racing game uses actual sledges with mobile phones attached to them as controllers, which proved to be a real fun to play it that way. Players have to avoid obstacles like trees and frozen pools of water, collecting gifts on the go. 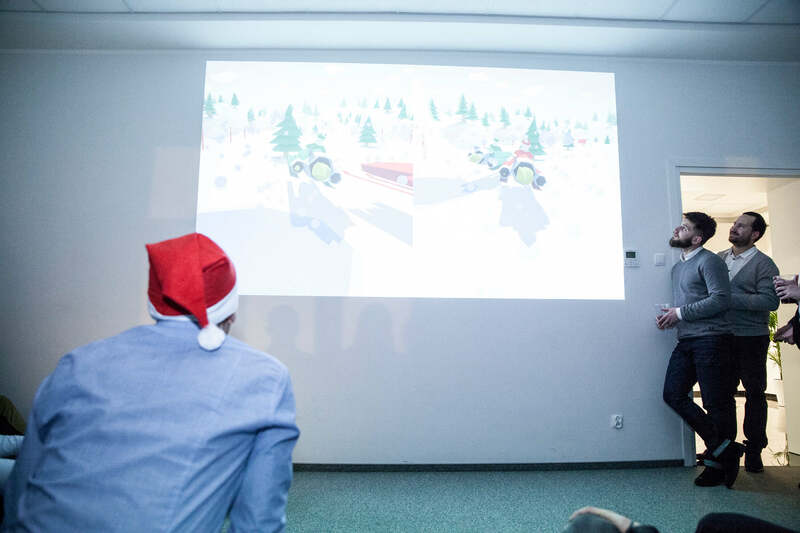 Another project presented during our party was a VR game, called Santa Is Coming To Town. The player, wearing a VR cardboard headset with a smartphone, had to drive virtual Santa’s sleigh to avoid obstacles and throw gifts into the chimneys. Harder than it seems, it was a great fun! Last but not least, there was a Holiday quiz game called PoKarp Christmas Show. It’s a game for up to four players, using their smartphones to answer Holiday-themed trivia questions. The game was designed to be engaging for live audience, who were able to watch the game unfold on a TV screen. Each round presented the contestants with new challenges and game mechanics. Together with over-the-top production design and 90s throwbacks it was a cool shoutout to the good ol’ days. 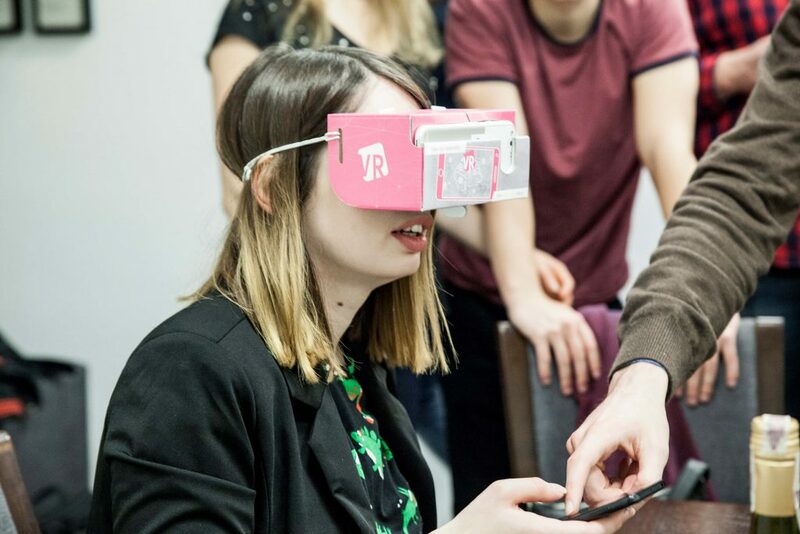 All teams developed interesting products and based on the reactions during and after the Holiday party, we can attest all of them were highly engaging. There can only be one winner, however, and Intense hackathon in 2017 was won by the Sled Run team! After the hackathon, we wanted to evaluate this experiment. A valuable insight for us is that all tech leaders admitted that the hackathon let them learn new things, including learning more about running a project and developing hard skills. All of them also want to participate in the next edition. Other team members also said that they were able to benefit from it, e.g. learning more about software development process, managing themselves, and software testing. Plus, we’ve learned that 88% of people we asked liked the way it enriched the Holiday party. “I liked the hackathon’s finale very much! It grabbed everyone’s attention, was a big surprise and all teams presented their projects in an interesting way” – said one of the attendees in our poll. But there are always areas for improvement, too. We want to find a way to include more people, as 60% of employees were engaged during this edition. And although the Intense’s finale during the Holiday party came together extremely well, developing projects in such a busy period was quite exhausting for some people. What’s next? Another edition of Intense. We’ll take everything we’ve learned into account and come back some time this year. Stay tuned!